On March 18, 1990, two police officers—or so they seemed—walked into a Boston museum and left with $500 million worth of paintings. They have never been found. 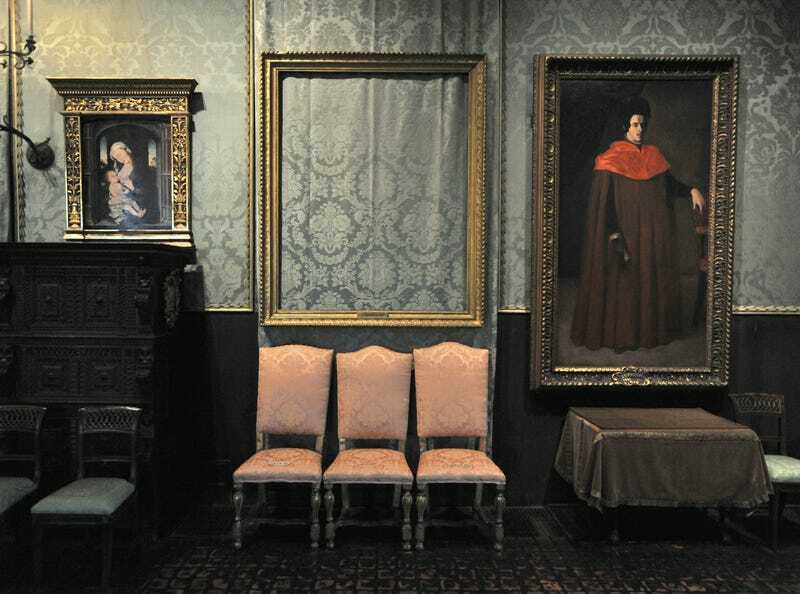 The two thieves seem to have gained access to the Isabella Stewart Gardner museum in the wee hours of the 18th by claiming they were investigating a report of a disturbance (remember, they were dressed as cops). They then detained the guards and proceeded to cut priceless paintings out of their actual frames, making off with thirteen works including paintings by Degas, Vermeer, Rembrandt, and Manet. These paintings have never been recovered—despite the $5 million reward. The heist has fascinated and obsessed people for exactly 25 years. It's become a career-defining investigation for more than one journalist, several of whom have written entire books and even become entangled with law enforcement themselves in their quest to uncover the paintings. Yesterday, one of these journalists—Tom Mashberg, author of Stealing Rembrandts—recounted his years on the hunt for the works in The New York Times, where he frequently covers art theft and repatriation. He also mentioned a litany of other theories, which themselves are completely fascinating. Let's take a look. [The FBI] points to a local band of petty thieves — many now dead — with ties to dysfunctional Mafia families in New England and Philadelphia. It also suggests they had help from an employee or someone connected to the museum. The FBI said as much in 2013, saying that the Bureau had a "high degree of confidence" that the stolen paintings eventually made their way south towards Philly and even Connecticut, where they were sold. "With that same confidence, we have identified the thieves who are members of a criminal organization with a base in the mid-Atlantic states and New England," the FBI said during a press conference. But even if these figures were involved, which seems pretty likely at this point, there are a number of places the paintings could have wound up—and a number of ways they could have gotten there. Federal Bureau of Investigation (FBI) Special Agent in Charge Richard DesLauriers in 2013. AP Photo/Steven Senne. "I never ruled out the idea the IRA was involved," he said. "Because, if you go back to that period particularly, the IRA was actively stealing art in Europe. They were stealing art from some of the big mansion houses in Ireland and then fencing it somewhere in Europe. So I never completely ruled that out, but it sounds like the authorities have ruled that out." This is one of several theories that involve European criminals and dealers—after all, these paintings were all painted by middle European artists, with the exception of a Chinese vase that was also stolen. A security guard stands outside the Dutch Room of the Isabella Stewart Gardner Museum in 1990. AP. He was a Mayflower descendant, he was a member of Mensa, he headed a band called Myles Conner and the Wild Ones that played with Roy Orbison and the Beach Boys, and he was a prolific art thief. He had stolen Japanese statutes; had stolen Colonial-era grandfather clocks; stolen old master paintings; he robbed the Smithsonian, Washington, D.C.; he robbed the Metropolitan Museum of Art in New York City. But Connor would have had to design the heist via prison, if he was really involved. A few years ago, Mashberg himself commented on WBUR that it's entirely possible Connor played a role in the heist, since he was peripherally involved with specific mob figures the FBI says played a part in the crime. So, about those Europeans. The founder of the FBI's Art Crime Team, Robert K. Wittman, believed he was near recovering at least some of the works when he conducted an undercover operation targeting French-Corsican criminals who claimed to be selling works by Rembrandt and Vermeer. In his 2011 book, Priceless – How I Went Undercover to Rescue the World's Stolen Treasures, Wittman describes how in the end, the French police blew his cover and the operation was ruined. Read more about it here. Federal Bureau of Investigation (FBI) Special Agent Geoff Kelly in 2013. AP Photo/Steven Senne. My theory is that someone then did it as a lark, just to see if they could do it. And once they did it, they kind of asked, now what? They couldn't sell them, so they decided to dump the paintings at the dock. But the truth is, no one knows! Anything is possible. It's a 25-year-old ongoing crime. Mr. Kelly said he rejected the notion that the art was destroyed by the thieves as soon as they realized they had "unwittingly committed the crime of the century." "That rarely happens in art thefts," Mr. Kelly continued. "Most criminals are savvy enough to know such valuable paintings are their ace in the hole." In the end, this is a fascinating story for reasons beyond the crime itself. The work of brilliant journalists like Mashberg have played a pivotal role in the FBI's investigation. In a way, the Gardner heist set a precedent for the many independent journalists who are investigating cold cases today. Of course, it's also a cautionary tale about public participation—the hundreds of leads that the FBI has followed have all gone cold. Will the paintings ever be rediscovered? The grimmest fear seems to be that the paintings were hidden by the criminals—and the criminals are now dead. As the decades pass, the odds of finding the paintings could be slipping away, too. Let's hope that's not the case, and that the quarter century of work by journalists and investigators won't come to nothing. So, what do you think? Do you have your own theory? Lead image: The empty frame from which thieves cut Rembrandt's "Storm on the Sea of Galilee," seen here in 2010. AP Photo/Josh Reynolds.